This large sectional sofa features six comfortable seat cushions, providing family rooms with enough space to accommodate a large family or an assortment of guests. 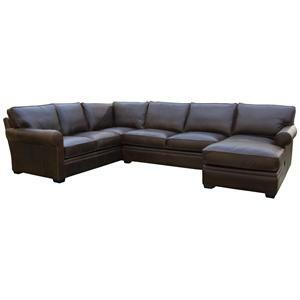 A traditional styled furniture piece with a comfortable welcoming aura, this large corner sectional features smoothly rolled arms and exposed wood block feet. Plush pillowed cushions in traditional box styles, adorn the seat of this family room sofa while box and t-style seat cushions adorn the seat back with an equal padded comfort. Perfect for family rooms with a traditional elegance and casual vibe, this upholstered sofa will complement homes as well as family needs. 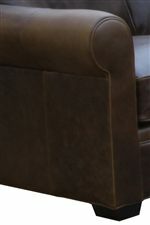 The 1251 Large, Comfortable Corner Sofa with Chaise by McCreary Modern is available in the area from BigFurnitureWebsite. 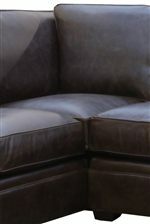 1251-LOLB Armless Loveseat 1 63" 40" 37"
1251-XLLB LAF Sofa Return 1 99" 40" 37"
1251-CRLB RAF Chaise 1 38" 66" 37"